How to Stream MKV to Apple TV for Playback MKV on Apple TV? Apple TV MKV - How to Stream MKV to Apple TV to Play MKV on Apple TV? Apple TV is a tiny digital media player which allows you to enjoy a whole world of movies, TV shows, sports, music, and more. So far, the latest version of Apple TV is the third generation, in up to 1080p HD. The device also plays content from any Mac OS X, iOS device or Windows with AirPlay or iTunes. Motion JPEG up to 720p at 30 frame/s. Can Apple TV Play MKV? The first thing to know or has well known is that there are only two official and free methods to stream video files to Apple TV from computer: iTunes or AirPlay. Unfortunately, neither of the two supports MKV as the input format. Likewise, you'll be greatly disappointed if you turn to other alternatives since most of them are not only expensive but also have inevitable defects: only support several formats, require installing some plug-ins, and with an endless line of embedded goods, etc. This tutorial will show the simplest and widely used way to stream MKV or HD MKV to Apple TV to play MKV on Apple TV, Apple TV 2 and Apple TV 3. How to Stream MKV to Apple TV? To successfully stream MKV or HD MKV to Apple TV, here, I strongly recommend to convert MKV to Apple TV as well as iTunes and AirPlay supported formats with Faasoft MKV to Apple TV Converter. Faasoft MKV to Apple TV Converter is designed to solve the issue of failing to play MKV on Apple TV for Mac and Windows users. With this ideal MKV to Apple TV Converter, streaming MKV to Apple TV via iTunes or AirPlay gets easier and faster, even if the MKV file is in HD. Except converting MKV to Apple TV compatible formats to easily stream MKV to Apple TV via iTunes or AirPlay, the powerful Faasoft MKV to Apple TV Converter also can convert almost all kinds of videos like AVI, WMV, FLV, WTV, MP4, MOV, ASF, MXF, OGV, 3GP, and WebM, etc to Apple TV recognized formats. Better still, Faasoft MKV to Apple TV Converter works as a built-in editor too, so that beautifying video files as your liking before conversion becomes true. How to Convert MKV to Apple TV Format? 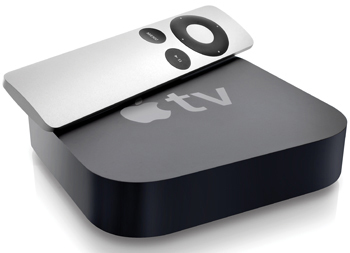 Follow the three steps to convert MKV to Apple TV formats. Click "File" or "Add File" button of the program to select MKV file that you want to convert from your computer. 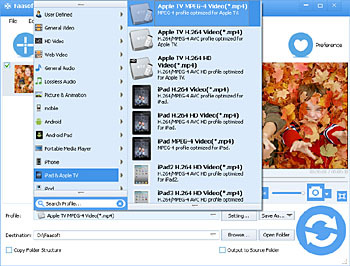 Or simply drag and drop video file to the main interface of Faasoft MKV to Apple TV Converter. Click the drop-down button of "Profile" to set the output format from "iPad & Apple TV" category. Note: Select "Apple TV H.264 HD Video (*.mp4)" as the output format, if the source MKV file is HD. Click the big "Convert" button to start and finish MKV to Apple TV conversion with fast speed and high quality. Now, all content are streamed to Apple TV for enjoyment. Could you image an easier way to do this than Faasoft MKV to Apple TV Converter?